Home » Kanab Blog » Uncategorized » Belly Of The Dragon Hike! Family Friendly! 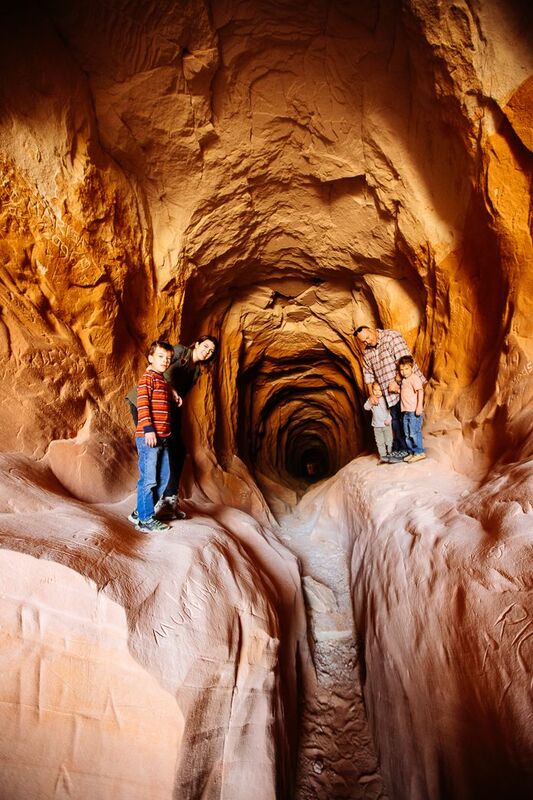 A short walk through a manmade tunnel is the highlight of this unique, family-friendly trail located just 20 miles east of Zion National Park. 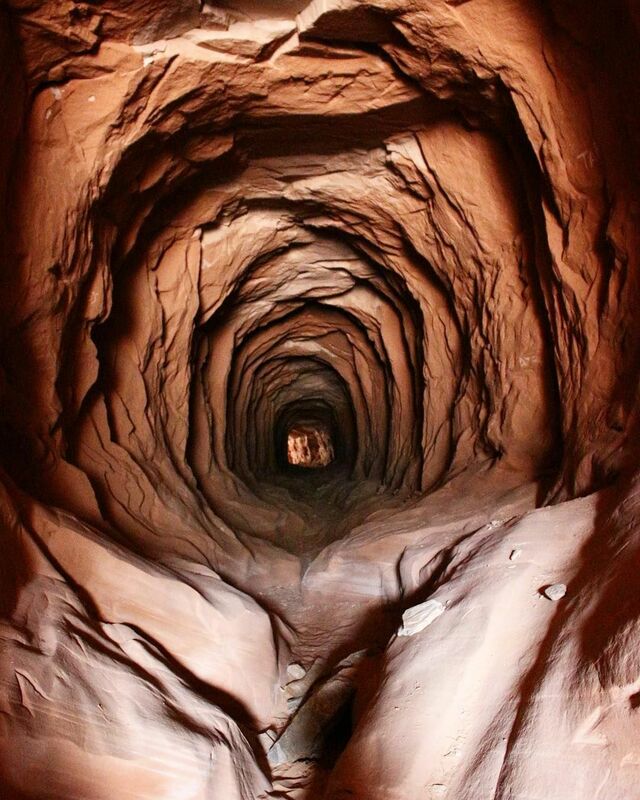 The cave-like tunnel/Belly of the Dragon was originally created as a water culvert under HWY89 but over time drainage from upper canyon water flow has carved the sandstone walls and created a beautiful rippling tunnel prime for exploring. This is such a great adventure with kids so bring the whole family and have some fun! This is super short .5 mile round trip hike. I consider this an easy, family-friendly hike. A 5 foot drop down to the tunnel in the very beginning is the hardest part of the trail. There is no elevation gain but the floor of the tunnel is rocky and uneven so make sure to bring a flashlight or use your cell phone to shine some light in the middle of the tunnel so that no one trips. Located 16 miles north of Kanab or 1/2 mile south of Carmel Junction along HWY89. The dirt road is on the west side of the road between two guard rails. Drive a well-maintained dirt road 1/4 a mile to a small parking area on the left. Click here for map and directions. From the parking area, a short walk on a dirt road will take you to the tunnel. A quick climb down a 5-foot drop (kiddos will need a little help here) and you will be at the entrance to the tunnel. The tunnel is short so spend some time exploring and checking it out. Depending on the time of day and how light it is outside you will most likely need some extra light in the tunnel so that you don’t trip on the rocky, uneven floor. Past the tunnel, you will hike through a wash until you reach a dead end. The rock wall at the end is interesting and this is a great spot to stop for a snack break, have a picnic, or let the kids run around. Scroll down for tips and additional information.